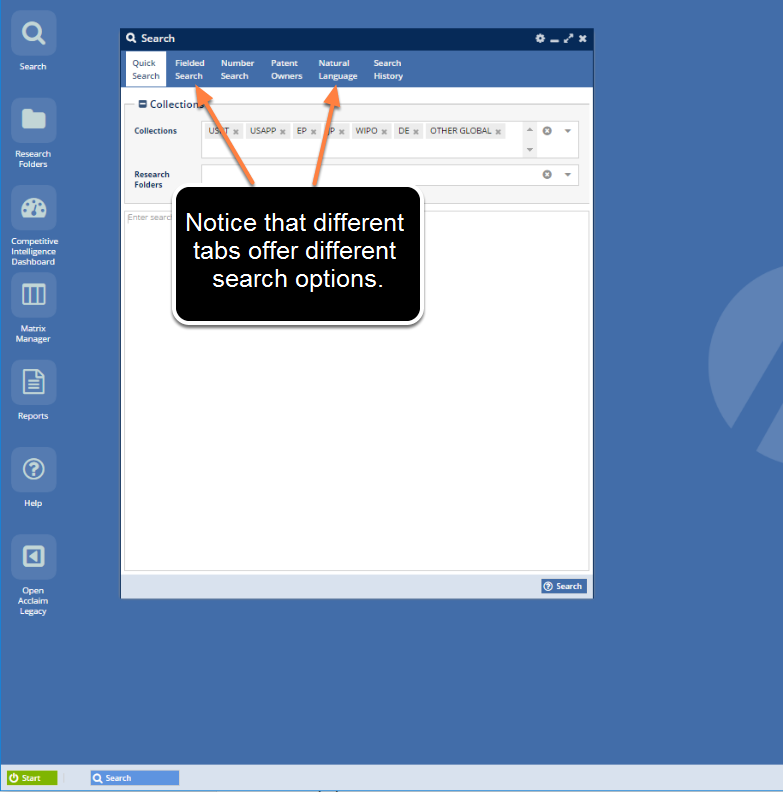 The advanced search tabs provide many tools for searching patent data. Title, Abstract, Specification, and Claims. Published Date, Filed Date, Priority Date, Last Transacted Date, Next Maintenance Date, and Estimated Expiration Date. US Patent Classification (USPC), Cooperative Patent Classification (CPC), and International Patent Classification (IPC). Inventor Addresses, Attorney Addresses, Assignee Addresses, etc. Meta fields are often counts, such as the length of claim one, number of inventors, number of forward or reverse citations, number of claims, etc. They are useful as value indicators and for doing analyses not possible with the basic patent data alone. Collections Options (1) is set to search US granted patents only (USPT). Stemming (2) is on (will return patents with words like "emitting" and "emitter" in the Abstract, for the example query in the image above). Returned patents will contain the word "endoscope" in the Title field (3). Returned patents will contain the words "light" and "emit" in the Abstract field (4). A date range has been applied in the Date Fields (5) from the current date back 20 years. Click the Search button (6) to execute the search. 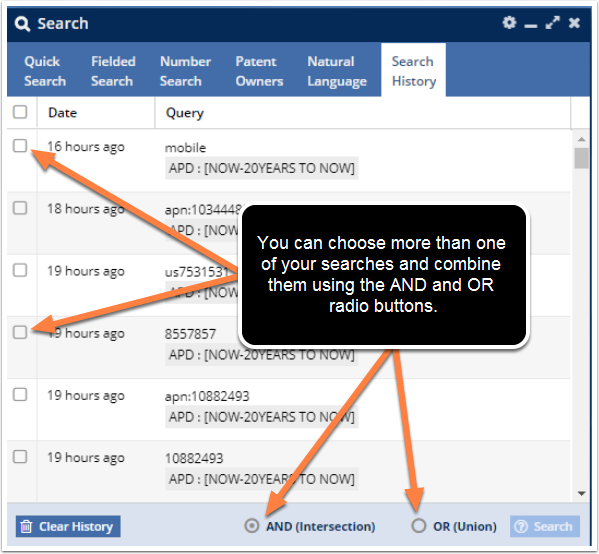 The Number Search tab allows you to search for one or more specific patents. For example, if you have a spreadsheet with 100 patents you would like to look up, you can copy and paste the numbers into the search box and search just for those patents, either with or without the Family Members included in the results. The Patent Owners tab allows you to search for patents grouped by the patent's owner. 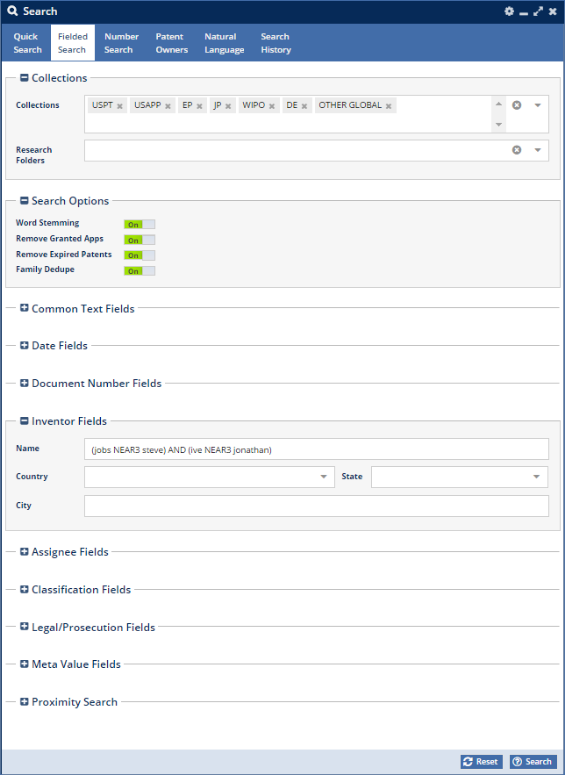 In this tab, you can search by either the Original Assignee or the Current Assignee. As with the other tabs, you can include which collections you would like to search (USPT, JP, EP, etc.). The Natural Language tab allows you to search for patents based on a text query of up to 5,000 words of text. AcclaimIP will find documents similar to the source text that you supply. For example, if you have a paragraph from a specification and you want to see what other patents are similar to the language in that paragraph, you can copy and paste the entire paragraph into the natural language search query and run the search. The Search History tab is your saved search history. For example, if you searched for "endoscope" in the Title, and "light emit" in the Abstract fields, when you came back to AcclaimIP at a later point, you would be able to find that particular search in the Search History tab and run the search again without having to retype anything into the proper fields. The number of searches saved to your search history is set in Preferences>Results Grid. Note that you can combine searches with either an AND or an OR function by choosing more than one search from your search history, clicking the AND or OR radio button, and clicking Search. 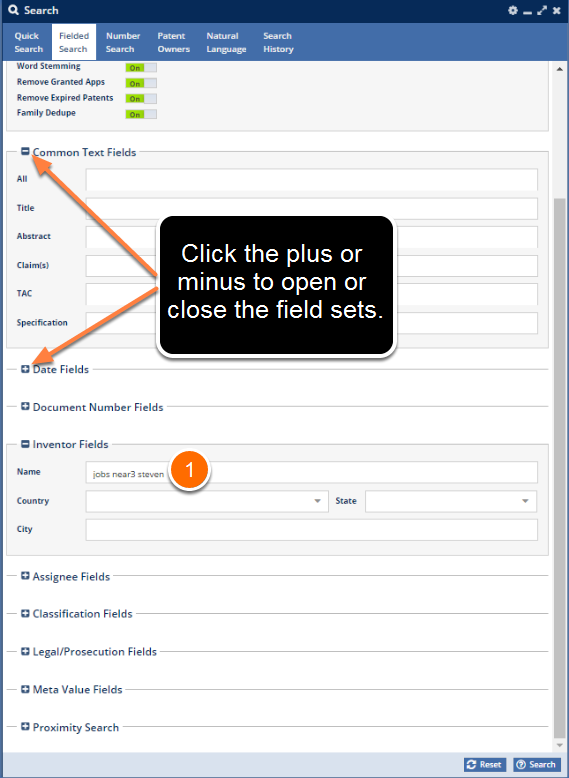 To save room on the form, many of the searchable fields are grouped into "field sets" which you can open and close. 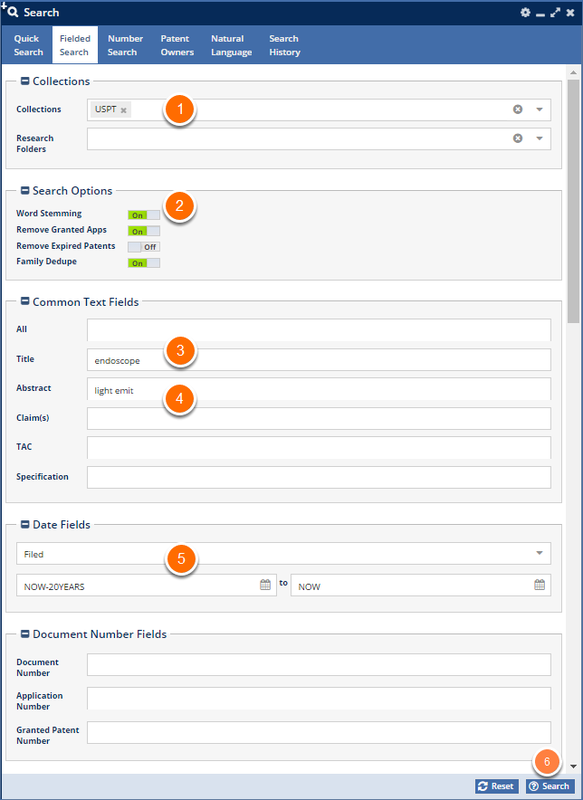 In this example, I opened the Inventor Fields field set to expose the search options for inventors. Notice I used the query jobs near3 steven for the inventor's name (1). This is a proximity query. It says find patents where the "words," "steven" and "jobs" appear within three words of each other. This is a handy way to pick up instances like "Steven P. Jobs," in the Inventor field for example. You can also use the search "jobs steven"~3 to return the same results. To find all of Steve Jobs' patents you should use the search "steve near3 jobs" (without using the quotation marks, or "Steve Jobs"~3 where you do use the quotation marks) with Word Stemming on. You can use some Advanced Syntax inside of Fielded Search. In this example, you see that this will find patents where Steve Jobs and Jony Ive have collaborated on patents. (jobs NEAR3 steve) NOT (ive NEAR3 jonathan) --> Patents by Steve Jobs, but NOT Jony Ive.